Fernwood Cove is a uniform camp, meaning that all members of the camp community wear required uniform each day. Staff uniform consists of navy blue bottoms and white tops. Additional uniform requirements are provided after hiring. Fernwood Cove provides each staff member with one staff uniform short sleeve shirt and one uniform warm outer garment. Staff are responsible for supplying their own uniform items for the summer. Limited uniform items are available through our uniform provider, Amerasport. Fernwood Cove is a tobacco-free property. The use of tobacco, including e-cigarettes, on Fernwood Cove property is prohibited. The use of tobacco and related products is also prohibited while complete work-related tasks out of camp and any time in camp vehicles. Failure to follow these policies is reason for immediate dismissal. Summer weather in Maine typically includes warm, sunny days, and cool nights. July temperatures include an average daytime high of 80 F (26 C) and nighttime lows of 60 F (15 C). The weather in the early weeks of June and latter weeks of August can be cooler, so it’s always a good idea to have a variety of clothing so you can wear layers. A rain jacket is a must as camp continues rain or shine! Each day of camp is packed with a variety of activities and opportunities. Our days typically begin at 7:15 AM and camper bedtimes vary by age group. 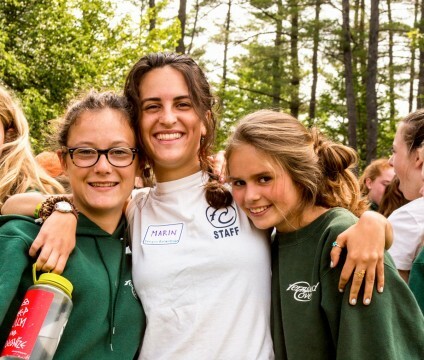 Camp Counselors must be prepared for long days of work that includes activity instruction, supervising bunk life, leading trips, and participating in and leading evening programs. Find out more about the various activities and events that are included in our camp program. A full packing list will be provided after hiring. Weekly laundry services are provided, so staff only need to pack for approximately 10 days of clothing. Remember to pack everyday street attire (non-uniform) to have when you have time off. Good quality shoes are a must! Staff who would prefer to drive to camp and have a vehicle at camp for the summer are welcomed to do so. Camp will provide transportation from Portland, Maine for those staff who will be flying to Maine or taking a bus from a New England city. Additional information regarding transportation to camp will be provided after hiring. There’s nothing better than receiving mail while at camp. All mail should be addressed to you with the Fernwood Cove address. Please be aware that Fernwood Cove is a nut-free property, so please ask friends and family to not send any products containing nuts. To ensure the safety of everyone at camp staff must obtain permission from a Fernwood Cove director prior to having visitors at camp. Additional information will be provided during our staff Pre-Camp Training. Fernwood Cove is surrounded by amazing outdoor and cultural opportunities. The towns nearby provide all the basic necessities. Portland, Maine is just over an hour’s drive from camp. Staff can enjoy everything from shopping, to local restaurants to baseball with the Portland Sea Dogs. If you go an hour in the opposite direction of camp you’ll find yourself surrounded by the White Mountains near North Conway, New Hampshire. Fernwood Cove girls are 7-17 years old and come from throughout the United States and around the world. They bring with them a multitude of talents and interests, and loads of camp spirit. Fernwood Cove girls are warm and friendly, and love the inclusive community that Fernwood Cove provides. They are excited to share Fernwood Cove with each staff each summer. And they love making memories with their bunk and activity counselors throughout their days at camp. All staff participate in our 9-day Pre-Camp Staff Training. Pre-Camp Training provides a wealth of knowledge about Fernwood Cove policies and procedures. Staff develop skills related to activity instruction and learn what it’s like to live in a bunk. Additional training clinics for staff that work in specific activity areas are provided prior to Pre-Camp Staff Training. Relationship building is one of the key aspects of the summer camp experience. This starts well before the summer for Fernwood Cove staff. Social Media groups, hometown gatherings, and Staff Buddies all provide counselors with the opportunity to connect with each other prior to arriving in Maine. Returning staff are keen to meet new staff and help them prepare for the coming summer! Life in a camp bunk is a unique experience that creates family. Fernwood Cove bunks are wood frame buildings with screened windows. Fernwood Cove bunks do not have electricity so having a quality flashlight (torch) is key. Campers and staff sleep on wooden framed beds, with older campers enjoying bunk beds. At least two female counselors, bunk moms, live in the bunk with a group of campers. Bunk Uncles, the male counselors in camp, are a part of the bunk family, but live in separate housing at camp.